The Rigg part of my family has many links to the Furness area of Lancashire in what is now southern Cumbria; the area being historically known as 'Lancashire Over The Sands'. Some time ago, I started to organise my family records and information and research further into my family history. I have now gathered it together here as my Rigg family story for my own records and for other's use. The three historic counties of this region Cumberland, Westmorland and Lancashire Over the Sandds which now form the modern county of Cumbria, which was established in 1974, still show evidence of their existence throughout the area. It's in this area that my Rigg family ancestors lived and worked for many generations - the earliest record I have being in 1776. This part of the historic county of Lancashire was also part of the historic County Palatine of Lancaster. 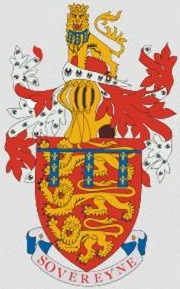 The arms of the Duchy of Lancaster. 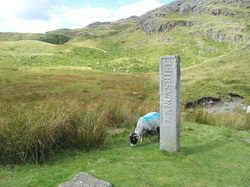 The Three Shires Stone at the top of the Wrynose Pass marks the meeting point of the counties of Cumberland, Lancashire and Westmorland, the boundaries of which existed up until local government reorganisation in 1974. Helping to connect my Rigg family story is the River Duddon, which rises near this marker stone at over 1250 feet above sea level at the highest point of Wrynose Pass. It then descends to the sea over a course of about 15 miles before entering the Irish Sea at its estuary near Kirkby in Furness where many of my ancestors lived and worked. 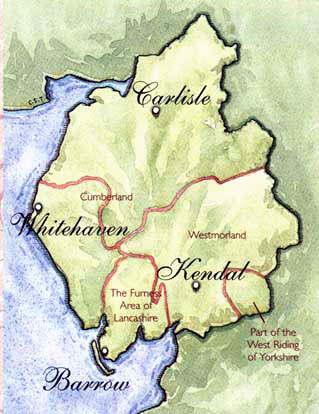 For its entire length the Duddon forms the boundary between the historic counties of Lancashire and Cumberland. Please note that most images on this website will open an enlarged version when the image is clicked. Rigg ancestors forming my line of ascent are shown in bold. Links to other websites providing further information have been provided in some places and are indicated in light blue text. Other parts of my family's history will be included in other websites which I have created which can be followed from the links page. This site has been created purely as a personal record of my family history. It is as accurate as my research has allowed. It is not affiliated in any way with any organisation referenced here. Some images included in this website may be subject to copyright.